Quiz your staff in the hallways, "How do we ask for reviews?" 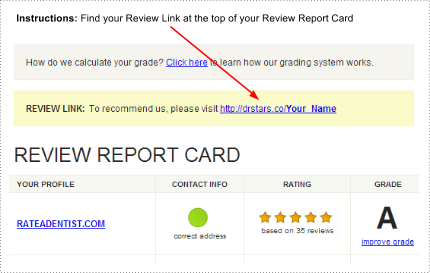 To find your doctor's Review Link, ask for his/her Review Report Card. The link is located in the yellow box on top of the report card.Did you know: You can request to be CC'd on the doctor's report card.Go ahead and give this link a try on your own mobile device or computer right now so you can experience it in action. Quiz your staff in the hallways about how to ask for online reviews. They should be able to recite the warm up, "How was your visit? Can I get you anything?" Then they should move to, "If it wouldn't be too much trouble, would you leave us feedback online? You can do it right from your mobile phone: www.drstars.com/Good." One thing you may want to consider is ordering a pack of Review MiniCards so your doctor and staff don't have to write the Review Link down. It costs $29 for a pack of 100 MiniCards. Here is what they look like:MOO.com is our printer. The term MiniCards™ is a trademark of MOO.com, which is headquartered in London, UK and doing business in the USA. To fast-forward this lesson plan and talk to EMPATHIQ about establishing a protocol in your office to get more reviews, please call 866.407.6020 or email support@empathiq.io. Last week's lesson was expected to get a review from 1 out of 50 patients. However, when done in conjunction with this week's lesson, as many as 1 in 20 patients will leave you a positive review.